Add a decorative edge to your tree circles or flowerbeds using the Gardeneer Hammer Edge Border Fence. 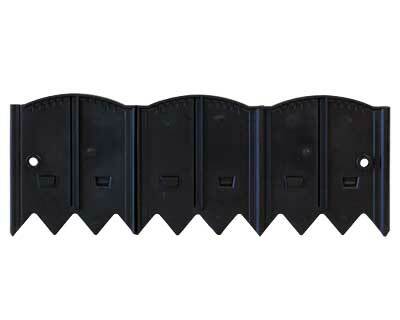 This convenient and versatile edging helps your yard stay tidy while aiding the environment. Placing a border around flowers and trees keeps mulch in the bed, as well as prevents grasses from overtaking your plantings. The scalloped edge at the top of the panels brings a decorative look to this item, and the interlocking channels on each edge help the pieces stand upright together. Additional channels on the back of the panels allow you to create right angles with the fence, for a geometric feel. Each section has reinforced hammer points, so it can be hammered into the ground without fear of it breaking. The pointed teeth insert into soil with ease, and the black color looks great in any setting. Pound this edging into the ground only a slight bit to contain mulch, or insert it deeply around a planting bed to prevent root systems from spreading. The panels are crafted from 90% post-industrial recycled content, keeping waste out of landfills, and the plastic construction will last for several seasons. Line your flowerbed or planter bed easily and beautifully with this Hammer Edge Border Fence. Made in the USA.